Researchers at MIT have unveiled a clever new treatment plan that they say can neutralize almost any viral infection. They call it "Double-stranded RNA Activated Caspase Oligomerizer" (or DRACO if you're into brevity and awesome acronyms), and effectively it functions in much the same way as a firebreak. Whereas firefighters remove swaths of vegetation in front of a forest fire to deprive it of fuel, DRACO effectively targets and kills those human cells that have become hosts for the invading virus, forcing the aberration to burn itself out. 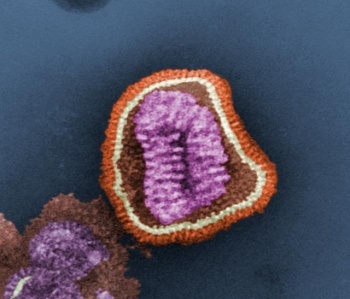 Viruses work by inserting themselves into a cell and hijacking its machinery for its own use. The invaded cell then creates more copies of the virus, which involves creating long strings of double-stranded RNA - which contains the virus' genetic material, like DNA contains ours. When the virus is done copying itself, its hostage cell usually dies, from the virus bursting through its walls (lysis), changes to the cell's outer membrane, and from apoptosis, or programmed cell death. Human cells have plenty of defenses against viral invasion, including proteins that attach to the double-stranded RNA, preventing the virus from replicating itself after successful invasion. This new drug therapy combines those dsRNA proteins with a protein that induces apoptosis. It's called a DRACO, Double-stranded RNA Activated Caspase Oligomerizer. When one end of the DRACO binds to dsRNA, it signals the other end of the DRACO to induce cell suicide, an MIT News article explains. In this way, the cell is killed before the virus can take over and eventually kill it anyway. If there is no dsRNA, the healthy cells are left alone. The neat bit is that DRACO should, in theory, work on almost any virus, as instead of attacking the virus directly (as conventional treatments would), it instead targets the viral "food supply." This concept is not exactly novel however. There are already drugs on the market that do much the same thing as DRACO, though they largely are only effective against a single virus, or at best, a handful of similar viruses. The big advantage of DRACO is that so far, it seems to function on such a fundamental level that it has proven effective against nearly the entire swath of known viral agents. As with all such breakthroughs, we are still a few years of intensive testing away from seeing DRACO in widespread public use, though the potential here is simply mind-boggling. If proven viable, DRACO could quite literally be the fabled "cure for the common cold."